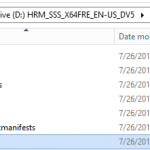 You are here: Home / SharePoint 2010 and SQL 2012 Could not find stored procedure 'sp_dboption'. On my first install of SharePoint 2010 with SQL 2012 I encountered this error when running the configuration wizard : Could not find stored procedure ‘sp_dboption’. The reason is that SQL 2012 only works with SharePoint 2010 Service Pack 1 or higher. So, in order to avoid this problem, slipstream Sp1 in your SharePoint 2010 install. Or if you already installed SharePoint 2010 without Sp1 and you are having this error right now, just download Service Pack 1 and install it before running the configuration wizard.